The idea of activity trackers is far from new. Leonardo DaVinci wrote about trying to create a pedometer as early as the 15th century, but today’s activity trackers are far more sophisticated that DaVinci could have ever expected. Learn more about how you can incorporate this new tech into your fitness business. Fitness band allow users to track and measure their metrics throughout the day. While these devices range in price starting at around $50, the amount of features incorporated varies from device to device. The Fit Bit is a popular brand that allows its users to track metrics like calories burned, stationary time, sleep activity and other essential metrics. Withings Go is a more economical alternative that tracks basic metrics like steps and distance. While each band offers their own unique features, the information gathered by the trackers can help your clients stay in line with their goals. 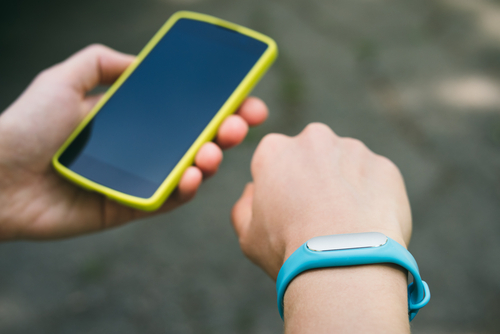 Using an activity tracker allows your clients to monitor all of their activity, to have a more comprehensive view of their fitness. Wearing the band can also act as subconscious reminder to stay active. Although these devices accurately read most activity, there are still circumstances where these devices can fail or be harmful to a client’s health. Complex movements and quick steps tend to affect the accuracy of the activity tracker. Since these monitors are generally worn on the wrist of the user, the measurements become skewed because less arm movement is being made. The same holds true when measuring the amount of energy expended. Activity trackers can only track activity, so these wearable pieces of tech should not be consider to measure a person’s overall health. While being diligent with one’s workouts is important, fitness professionals should make sure that their clients are also focusing on fitness goals that trackers can’t measure like increased energy and better moods. To learn more about growing your business and making sure your clients know what you have to offer check out what SinglePlatform can do for you.